Government efforts at Public-Private Partnerships (PPPs) have to be uncomplicated and centered on reality checks of past failures said panelists who participated in the closing session of the Sri Lanka Economic Summit 2016, organised by the Ceylon Chamber of Commerce (CCC). Development Strategies and International Trade Minister Malik Samarawickrama, Foreign Minister Mangala Samraweera, JVP leader Anura Kumara Dissanayake and Performance Management and Delivery Unit (PERMANDU) Malaysia Chief Executive Officer (CEO) Dato Sri Idris Jala sat in on the discussion, which tackled the grave need to reform State-Owned Enterprises (SOEs) to reduce Government debt and encourage development. Taking a candid and eloquent approach to the key economic concerns currently gripping Sri Lanka, Janatha Vimukthi Peramuna (JVP) leader Anura Kumara Dissanayake told the gathering at the Sri Lanka Economic Summit 2016 that the public had genuine concerns over the Government’s plans as they were not clearly communicated and were not underpinned by effective implementation. Taking the example of rice, Dissanayake pointed out that the dominance of two companies was driving up the price of rice while driving down the price of paddy, resulting in both the farmer and the consumer suffering. However, he acknowledged that the JVP would support the offloading of non-essential public enterprises that were not directly improving the living standard of the poor. Dissanayake defended the masses resistance to privatisation by pointing out that while the Government was keen to recall the successful privatisation of Sri Lanka Telecom (SLT) they were averse to talk about numerous ventures such as the Sevanagala and Kanthale sugar plantations, Kankasanthurai cement factory, paper mills and handloom factories in Pugoda; all of which went into bankruptcy after privatisation. “The public have logical concerns because they have seen these bad experiences. That is why they are against privatisation. This Government talks about sweeping reform but has failed to even put together a clear Budget. There are huge implementation bottlenecks. Forget a five-year plan, give us a Budget that can be followed for just one year without amendments,” he told Foreign Minister Mangala Samaraweera and Development Strategies and International Trade Minister Malik Samarawickrama. 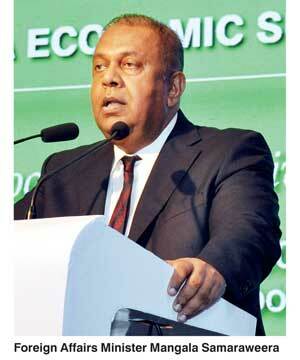 Samarawickrama in his turn noted that public enterprises were part of the public wealth of the people of Sri Lankans. Therefore it was absolutely necessary to set up a framework to help State-Owned Enterprises (SOEs) manage and operate as efficient commercial enterprises based on prudent commercial principles with resources on par with or greater than comparable enterprises in the private sector. With this objective in mind, the Government will shortly introduce a Public Enterprise Act in the next month. A Public Enterprise Board has also been indentified and will compromise representatives of the private sector and members of the public sector and members of trade unions and will be chaired by a private sector individual. “The large loss incurred by SOEs over several decades has been a major drag on the development prospects of the country. Reducing these losses make a significant contribution to releasing resources needed to achieve the development objectives of our Government. These losses undermine fiscal consolidation of our Budget and balance sheets of State Banks. While it is true that some of the SOEs have made profits I believe they do not meet their full potential. These are certainly not run as efficiently as they should be,” he said. The first channel through which the general population is affected by these losses is through the Government Budget. This means the Government has to raise tax revenues to meet these losses or else the Government has to borrow the money domestically and from broad. These debts have to be repaid by the people through future taxes. One way or another people have to bear the cost of financing these debts, clearly the revenue for these losses has to come out of the pockets of all citizens of Sri Lanka, the Minister noted. There are of course a number of recommendations, which have been made to improve the performance of these enterprises. Management practices need to be inculcated that demand accountability and transparency of these decision-making processors of boards. In parallel, operational independence needs to be increased to respond to market signals thereby reducing the need for Government assistance at a time when fiscal space is constrained and increasing competitiveness of services and lowering prices for consumers. The performance of SOEs, particularly monopolies, should be benchmarked against international standards. Efficiency can also be enhanced through competition through private participation, performance and management contracting as done in China. The balance sheets of two State banks from losses incurred by SOEs would facilitate the reduction of interest rates and boost investment and enhance the profitability of these enterprises. It would also lead to a lower interest rate regime. The disposal of non-strategic State assets would have positive fiscal impact at a time when the Government finances are being constrained by lower and commercial SOEs listing on the stock exchange will increase disclosure thereby leading to the improvement of operational efficiency. “Let me also say something in the encouragement of public services. Public-Private-Partnerships (PPPs) have added advantages on tapping into new technologies and expertise. Risk sharing in contracts PPPs can also contribute to reduction in costs and delays in construction. In addition, PPPs can increase the capacity of the industry and bring more innovation to specific sectors. Several countries including Chile, Brazil, Malaysia, Peru and South Africa have developed comprehensive frameworks for including PPPs in development projects. Experience also shows that a strong PPP framework, which clearly lays out policy, legal and institutional obligations for contracting PPPS goes a long way for creating the enabling environment to attract PPP. Our Government is working with the Asian Development Bank (ADB) and the World Bank to create such a framework. The Prime Minister in his forthcoming presentation of the five-year plan will set out strategies for SOE reform and disposal of non-strategic state assets, Samarawickrama stated. Foreign Minister Mangala Samaraweera yesterday went back in time to share his experiences in privatising Sri Lanka Telecom (SLT) and recommended a tripartite framework based on competitiveness, decoupling operational control from policymaking and regulation and infusing professional management to turnaround Sri Lanka’s platoon of loss-making enterprises. Given below is the Minister’s full speech delivered at the final session of the Sri Lanka Economic Summit 2016. When the National Unity Government was elected just over a year and a half ago, the Sri Lankan economy was at the precipice with economic stagnation, international isolation and even a forcibly imposed international inquiry into allegations of war crimes around the corner. Together, these circumstances forced the then Government to call a snap presidential election when it still had two full years left in its term. This election was meant to send a strong signal to emerging pro-democracy movements in Sri Lanka and the international community that, despite allegations of rampant corruption and nepotism, the Government remained popular. Under the previous Government the economy and employment stagnated. I need not go into details but allow me to share a few key statistics that are a snapshot of the situation just 19 months ago. The number of Sri Lankans searching for jobs remained roughly the same between 2009 and 2014. Exports as a percentage of GDP declined to 17% in 2014, down from 33% in the year 2000. Our foreign debt, used for wasteful projects like the Mattala Airport, reached critical levels. If that was not bad enough, an economic crisis was looming over us. Relations with our largest export markets, including the US and EU which account for over half our exports, were in a precarious state. Thanks to the previous Government’s atrocious human rights record we had already lost GSP+. Department of Commerce statistics show that in the six years since Sri Lanka lost GSP+ the total loss of export revenue was Rs. 150 billion. That sum is four times the education ministry’s entire budget in 2014. In addition, 150,000 people were made unemployed because of losing GSP+. The effects of the now lifted fish ban, although on a smaller scale, were similar. The worst was yet to come. Following consistent debacles at the Human Rights Council, in addition to the OISL international investigative report that was to be tabled in 2015, the road was paved for targeted sanctions and travel bans. This would have constituted the tipping point of a domino effect that would have more than wiped out the economic dividends of ending the war. The National Unity Government is now putting in place the framework for democracy, reconciliation and development. This framework will breakthrough Sri Lanka’s post-Independence malaise of consistently missing opportunities and simply doing too little too late. We have made great strides in the areas of democratisation and foreign affairs. We are making progress on reconciliation. The framework for the reconciliation process will be in place once the mechanisms outlined in the Geneva Resolution, which brought us a tsunami of international goodwill, and the new constitution, are implemented. The new constitution will entrench the changes we made under the 100 Day Work Programme and will help ensure that Sri Lanka is truly united and at peace for generations through a constitution that enshrines our multi-cultural, multi-ethnic, multi-lingual and multi-religious character. The next major challenge for Sri Lanka is development, particularly generating growth and employment. We need to provide a peace dividend to our people; they need to feel that year-by-year their pockets are fuller and their standards of living are better. As is now well-known, over the last decade, we have focussed our energy on our domestic market of 20 million at the expense of the tremendous opportunities we have due to our location at the centre of the Indian Ocean and at the gateway to the Indian subcontinent. But to secure the dividend we need and deserve, this government is finally beginning to leverage our location. We are securing concessionary access to nearly half the world’s population and some of the fastest growing markets. We are paving the way for investment in critical infrastructure in the Western Province, Hambantota and Trincomalee. And we are creating a financial city that will make Sri Lanka a financial services hub for the Indian Ocean region. But that is not enough. If we are to truly achieve the breakthrough that Singapore, Korea and the other East Asian tigers experienced, we need to reform our public enterprises. There are three main reasons for this: reforming public enterprise is critical for, one, improving Sri Lankan living standards, two, improving our competitiveness and, three, reducing corruption in politics and government. Public enterprises in Sri Lanka are largely loss-making because they are corrupt and inefficient. They suffer from chronic conflicts of interest, politicisation and are captured by vested interests. Take the case of SriLankan Airlines: although the Government at the time made it out that the renationalisation was an act of nationalistic fervour and portrayed it as a patriotic gesture, the true motivation for the nationalisation was to abuse and use the airline for their whims and fancies. The result was that SriLankan Airlines, which after privatisation started paying dividends to the Treasury for the first time, again reverted to making losses the year it was renationalised. In 2008 SriLankan Airlines made a profit of around $ 40 million. But within seven years this once profitable airline had lost nearly a $ 1 billion. That is, over seven years, each and every citizen of this country lost Rs. 5,000 in order to pay for waste and corruption. The cumulative losses of the largest five public enterprises are over Rs. 600 billion, more than the entire Health Ministry and Education Ministry budget combined. This is money that could have been used to provide English, Maths and IT teachers, provide vocational training and train doctors; not to mention upgrading our buses and public transportation systems. Or it could have been used for direct cash-transfers and employment schemes for the most vulnerable in society. In addition to crowding out critical government expenditure, failure to reform public enterprises also leads to higher costs for households and a lower quality of service for citizens. Take electricity: Sri Lankan households that are just above the minimum bracket pay some of the highest electricity prices in the world. Their quality of service is abysmal due to regular, unplanned power failures. Take public transport: our railways and public buses are overcrowded, don’t run on time and are the cause of nightmares for women who are harassed on a daily basis. Third, the monopoly positions of public enterprises prevent us from becoming competitive. High energy costs, poor public transport and an underfunded education system are not the right ingredients for competing against the new generation of East Asian Tigers like Vietnam. Where we have opened up to competition Sri Lankan firms have thrived. The liberalisation of the banking and LPG sectors means that Sri Lankan firms now compete with their rivals not only in Sri Lanka but in Bangladesh and Myanmar, the liberalisation of the Port means that Sri Lankan firms are operating ports in Fiji and similarly the reform of SriLankan Airlines, before the fatal renationalisation, was helping make Sri Lanka a regional aviation hub. What is the way forward? Here I draw from my experiences as Minister of Telecommunications in particular, in addition to my time as Minister of Ports and Aviation. Reform is most often successful when it is sequenced properly, and I think there are three steps that we need to take. First, bring in competition. The breakthrough reform in telecoms was allowing two private sector players to enter the market. Competition not only directly benefitted consumers by cutting prices, improving quality and increasing choice; this competition helped reform SLT and enabled Sri Lanka’s telecommunications boom. The second step is as critical. When I was made Telecoms Minister, the Ministry of Telecommunications had operational control over Sri Lanka Telecom. We also set policy for the industry and we regulated it. However, thorough the reform process we introduced good governance and limited these conflicts of interest. In other words, we trifurcated operations, policymaking and regulations. We handed over management control to NTT, a Japanese telecoms firm, and in the second stage of reforms reduced the Government’s stake to below 50%. We also created an independent Telecommunications Regulatory Commission to regulate the industry to which eminent, independent persons like R.K.W. Gooneskere, Deva Rodrigo and Norman Gunawardene were appointed. In hindsight, considering the trend to appoint ex-telecom officials to the regulator, perhaps we should have made the regulator more independent and answerable to Parliament instead of the Minister. But, all in all, these good governance reforms allowed the Government to focus on its real responsibility of setting policy without being distracted. We didn’t try to run a telephone company, we created the policies that created a level playing field and transformed communication in Sri Lanka. This is why to this day Sri Lanka Telecom continues to pay dividends to the Treasury and not be subsidised by the taxpayer like in India and Bangladesh. The results of these reforms speak for themselves. In 1995 one in a hundred households had a telephone line, just fifteen years later, in 2010 as teledensity hit 100%, almost every Sri Lankan had a telephone. Moreover, in the 1980s 38% of telephone lines in the Greater Colombo area were out of order at any given time. Applicants on waiting list for connections, about 250 000, exceeded the number of existing lines and waiting periods were on average a decade long. Similarly, as most of you will remember, when competition was introduced into the international calling market in 2002, prices fell dramatically to the benefit of consumers. Critical in ensuring the success of the reform process was bypassing vested interests and engaging directly with the real stakeholders that had an interest in SLT’s success. We bypassed union bosses and spoke directly to workers. We found the home addresses of the 8,500+ SLT workers and sent letters explaining the benefits of reform, including an employee share ownership scheme that accounted for 3.5% of total shares, to workers’ wives and families. That made sure that the letters weren’t withheld by the union hierarchy that were protecting their own interests. We also helped union leaders and workers understand the benefits of our reforms by sending them on fact-finding tours abroad. As a result SLT experienced one of the smoothest and most successful reform processes in the developing world. But that did not mean there was no political pressure. There was a lot of it but we had the courage of our convictions and we pushed the reforms through. And within a couple of years no one wanted to roll those reforms back. In conclusion, as Sri Lanka embarks on its third wave of reform allow me to distil my experience into three points. First, introduce competition. Second, limit conflicts of interest by decoupling operational control from policymaking and regulation. Third, ensure competitive operations by bringing in professional, independent management through management contracts and by listing stakes. I am confident that this tripartite reform framework commands the confidence of all stakeholders and will stand the test of time regardless of the Government that comes to power. However, as seen from the experience of SLT, introducing competition and resolving conflicts of interest will by themselves go a long way, but if their full benefit is to be experienced by citizens, the Treasury and the country, then the Government needs to entrench these reforms and prevent their rollback by transferring ownership to the private sector on a case-by-case basis, especially in industries where a natural monopoly does not exist. Technology-enabled private investment is the way forward to resurrect Sri Lanka’s failing agriculture industry according to a top foreign investor in the country’s agriculture sector. Duxton Asset Management Managing Director and Chief Investment Officer Desmond Seehy revealed that the country’s agriculture sector suffered mainly due to inadequacy of capital and high-quality infrastructure. He added that a lack of qualified people with specialised expertise in agriculture was another factor hindering the sector’s growth. Echoing similar sentiments, Export Development Board Chairman Indira Malwatte said most agriculture graduates did not return to their original fields and opted to work in places like banks instead. This led to a huge waste of knowledge and expertise, according to Malwatte. She also added that large-scale commercial agriculture was necessary but at the same time small-scale farmers should be provided with the necessary technology and linked up with exporters to ensure high-quality production. CIC seeds Chief Executive Officer Waruna Madawanarachchi stated that 28% of the country’s workforce participated in agriculture despite low levels of productivity. “One-third of the population contributes to one-tenth of the economy,” said Madawanarachchi. In the panel discussion it was revealed that many turned to agriculture as a last resort in their quest to find a suitable job. Madawanarachchi stressed that the private sector should strive for full ownership of total supply chain agriculture as it would enable a higher economics of scale and quality assurance. Kelani Valley Plantations Managing Director Roshan Rajadurai, highlighting the success of private sector involvement in the agriculture sector, said: “Currently, from the time of privatisation we have only 81% of the land we took over with over 53% of the workers at that time. We have improved our production more than 40% and our yield has also increased by 36%. This is in spite of our workers producing the lowest individual output in the world.” He added that Sri Lanka pays the highest wages in comparison to comparable economies. Regional plantation companies, recognising the magnitude of this issue, intend to discard the colonial attendance-based wage model and instil a productivity-based paying system. But undue political influence by certain individuals who prefer the previous system induces a severe strain on the successful management of a plantation, Rajadurai stated. He went on to assert that with the Government recently banning the use of weedicides in agriculture, plantation companies were facing an uphill battle trying to keep burgeoning costs down. “This ban has compounded the problem because without weedicides we cannot fertilise. And without fertilisers there’s no crop. And without crops our costs are going up,” said Rajadurai. In reference to the Government’s efforts to modernise the sector, Export Development Board Chairman Indira Malwatte explained that the EDB has taken an extra initiative in branding its agriculture products. “The Ceylon brand should be copywritten and used for other agriculture products to convey quality and freshness. However, it is not certified anywhere. When we tried to get Ceylon cinnamon we encountered this problem.” She added that the food and vegetable exporters association had requested to brand their pineapples as ‘Ceylon Pineapples’.